come with 100GB of storage on OneDrive for two years. In the first half of 2015, Samsung will begin pre-installing Microsoft Word, Excel, and PowerPoint in addition to OneNote, OneDrive and Skype on select Android tablets. For businesses, there will be three versions of Office 365 available (Business, Business Premium and Enterprise) which will be coupled with Samsung’s KNOX security solution. For those who aren’t familiar with Samsung KNOX, it is a solution that allows users on Android devices to easily select between a personal or business persona on their devices and the enterprise can control what is installed on that business persona on the device. The benefits to both organizations are pretty clear and given how impressive the Office experience is on an Android tablet it is a bit of a no-brainer in my view. I have a Samsung Galaxy Tab 4 and while I’m still not a huge fan of Android, this device is great and running the Office apps on it is what only I wish I had in Windows Phone. 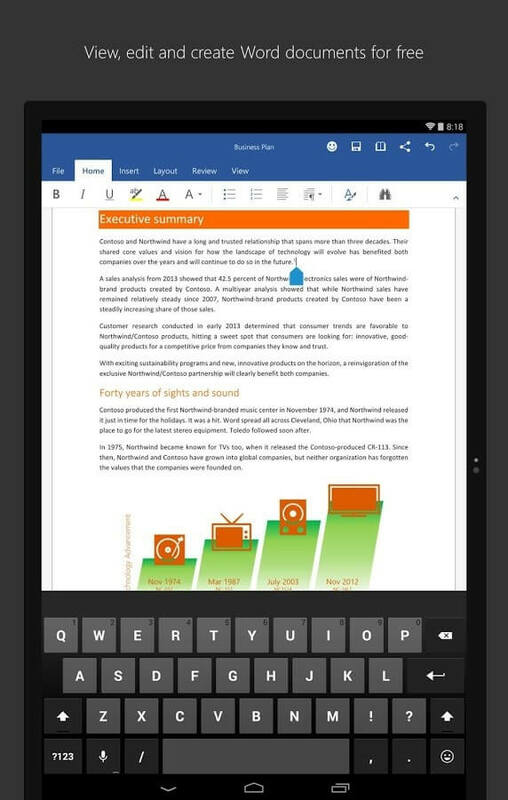 For those who prefer non-Samsung Android devices, you will still need to install the Office apps from the App Store.